The International Center for Media & the Public Agenda, founded in 2006, conducts media and policy research & works with global leaders on domestic and international issues of concern. The black and green word cloud graphic was generated by Wordle.com from the half a million words written by students in response to The World Unplugged experiment. The larger the word in the graphic the more frequently it appeared in the student narratives. The World Unplugged, a global study of university students’ media habits was led by the International Center for Media & the Public Agenda (ICMPA) in partnership with the Salzburg Academy on Media & Global Change. Close to 1,000 students in ten countries were asked to abstain from using all media for a full day. After their 24 hours without media, the students from the United States, Latin America, Africa, the Middle East, Europe and Asia were then asked to report their successes and admit to any failures. In aggregate, the students from the dozen universities wrote close to half a million words – or about the same number of words as Leo Tolstoy’s War and Peace. 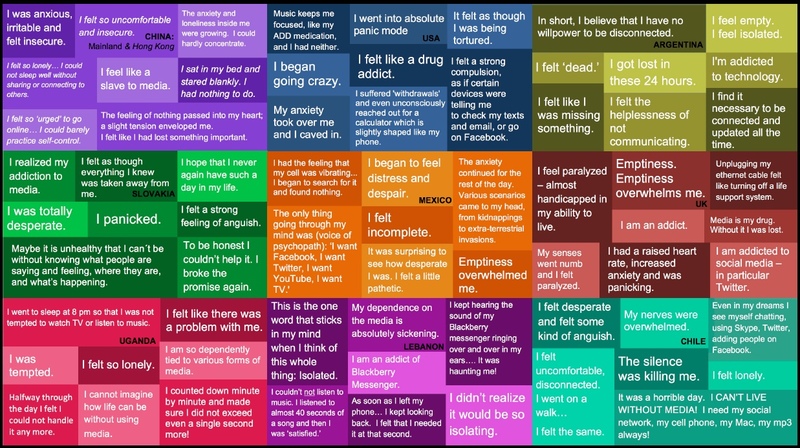 ‘Addiction’ grid: Click the grid to open up a full pdf poster of what students around the world had to say about how they felt during their 24 hours without media. 1. Students’ ‘addiction’ to media may not be clinically diagnosed, but the cravings sure seem real – as does the anxiety and the depression. Sharing analogies and metaphors made explicit the depths of their distress and likened their reactions to feelings of a drug withdrawal. 2. A clear majority in every country admitted outright failure of their efforts to go unplugged. The failure rate didn’t appear to have anything to do with the relative affluence of the country, or students’ personal access to a range of devices and technologies. What the reports documented was how essential AND pervasive digital technologies have become both for students individually and for their larger societies. 3. Students reported that media – especially their mobile phones – have literally become an extension of themselves. Going without media, therefore, made it seem like they had lost part of themselves. 4. Students around the world reported that being tethered to digital technology 24/7 is not just a habit, it is essential to the way they construct and manage their friendships and social lives. Students reported that increasingly no young person who wants a social life can afford NOT to be active on social media. “It was amazing to me though how easily programmed my fingers were …. It’s now muscle memory, or instinctual, to log into Facebook as the first step of Internet browsing,” admitted one USA-based student. 5. Students construct different ‘brand’ identities for themselves by using different communication tools to reach different types of people. This savvy generation of digital natives can rattle off an arms-length list of communication platforms they use simultaneously but in different ways. Students across the world reported that they call their mothers, they text and chat with close friends, they use social media to engage with their social groups, they email their professors and employers. 6. For many students, going without media for 24 hours ripped back the curtain on their hidden loneliness. Students were blind-sided by how much their 24/7 access to media had come to dominate their relationships. And the problems for some students went beyond loneliness. Some came to recognize that ‘virtual’ connections had been substituting for real ones – their relationship to media was one of the closest “friendships” they had. 7. Students from every country noted how desperately bored they were when they went unplugged. Particularly noteworthy was the short attention spans of the students – how quickly they lost interest in the alternative activities they did try. Some students became bored within a few hours; others in even less time than that. 8. Mobile phones are at the literal center of students’ lives; they function both as this generation’s Swiss Army knife AND its security blanket. If cartoonist Charles Schultz had drawn the character Linus today, he would be carrying a mobile phone rather a blanket. 9. What is ‘news’? To students, ‘news’ means ‘anything that just happened’ – worldwide events AND friends’ everyday posts. Most students around the world didn’t discriminate between news that The New York Times, the BBC or Al Jazeera might cover, and news that might appear in a friend’s tweet or Facebook status update. Students reported they they mostly got their news and information from Facebook, Twitter, and other social media — so they were cavalier about any need for traditional news outlets. 10. Most students reported that they rarely go prospecting for “hard” news at mainstream or legacy news sites. Instead they inhale, almost unconsciously, the news that is served up on the sidebar of their email account, that is on friends’ Facebook walls, that comes through on Twitter. “We no longer search for news, the news finds us,” said one student from the US. 11. Most students across the world noted that they have neither the time nor the interest to follow up on even quite important news stories – unless they are personally engaged. Students have become headline readers via their social networks. ‘140 characters of news is all I need,’ reported one student from the UK. 12. TV is all about escape. Students most commonly mentioned “finding something to watch” – which could be sports, popular shows, or classic programs – when they wanted to hang out with friends. Still others said they have TV on when they’re alone, so as to have another presence in the house. Others used it as “white noise” when they go to sleep. “TV is a favorite way to relax without thinking too much,” noted a student from Argentina. 13. Across the world, students depend on music not only to make their commutes to school and work more tolerable, but to regulate their moods. Over and over again students wrote that music both enhances – and shuts out – the environment in which they exist. 14. Email is not dead: it just skews older – and is for ‘work.’ Email’s greater formality, and more flexible space for writing copy or attaching documents, has come to fit a “work” need better than students’ 24/7 on-demand “social” needs. Most students use Facebook and texting (and secondarily voice calls) to communicate with friends. Students use email to connect to their professors and their jobs. 15. ‘Simplify, simplify.’ Across the globe, students admitted that although they knew they could be distracted by media, they hadn’t been fully aware of how much time they committed to social networking and how poorly they were able to parallel process. And many commented on the qualitative differences in even close relationships during the period they went unplugged. “What I mainly realized is that…when you really get off the media you realize… how many quality things you can do,” noted a student from Lebanon. Click here to go to the Global Unplugged Study Conclusions page, and read the lessons of this study for students, universities, media entrepreneurs and journalists. You may also want to click on the country pages to see specifics about how students in each country reacted to going unplugged for a day. The study results are also broken down by what students said about how they use specific media – mobile phones, social networks, news outlets, etc. – and what students said about how they felt going unplugged – their emotional responses, such as feeling isolated, bored, as well as relieved. ICMPA is based at the Philip Merrill College of Journalism at the University of Maryland, College Park.